Danville Area Chamber of Commerce and the Town of Danville present the Annual Lighting of the Old Oak Tree, a beautiful sight to see this holiday season! 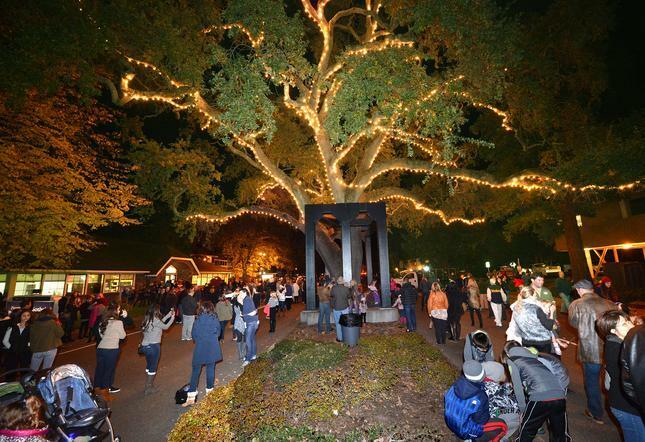 Lighting of the Old Oak Tree is a tradition with strong roots in the Town of Danville. The community gathers after Thanksgiving to honor the Old Oak. The celebration of Father Christmas, Snow Angel, music, and merriment makes for a great way to launch your holiday, all the way down to the last bite of a tasty Christmas cookie. San Ramon Valley High School Chorus under the direction of Ken Abrams provides the inspiration and vocals for the musical countdown to the the ceremonial lighting of the tree, officiated by Father Christmas and Snow Angel at 6:15 p.m. Follow Father Christmas and the Snow Angel along Prospect and Hartz Avenues in parade toward Downtown Danville’s continuation of the holiday theme. Musical entertainment and refreshments at stores, shops and restaurants invite the public to wander and check out the values for sale (even food gift certificates make great gifts!) The event is sponsored by Danville Area Chamber of Commerce and the Town of Danville.